Steven R. Schirripa, who plays the newly widowed Bobby Bacala on the hit TV show "The Sopranos" has a new book out, called "A Goomba's Guide To Life." In his book, Schirripa shows readers how to spot a goomba, how to be a goomba, how to talk/dress/act like a goomba, and most importantly, how to eat/cook like a goomba. He visits The Early Show Tuesday morning with tips for wannabes. Hint: It's all in the attitude! "A Goomba's Guide To Life" includes goomba career counseling, goomba heroes (Frank Sinatra & Joe DiMaggio), goomba baby names, insider information on goomba relationships, goomba dining, and tips on getting what you want. The following is an excerpt from the book. It includes one of Schirripa's favorite recipes. "What's a goomba? Who's a goomba? What's the difference between a goomba and a gangster? What's the difference between a goomba and a regular Italian? Are there goombas in outher countries? Is there any such thing as a Jewish goomba, or a black goomba, or an Episcopalian goomba? Keep your shirt on. I'm gonna lay it out for you here. This is the lesson on goomba. A goomba is a certain kind of Italian-American, probably born on the east coast- New York, New Jersey, Boston, Rhode Island - probably third-generation from the old country. He's not a gangster. He's not a wise guy, or a made man, or a good fella, or a member of the Family - but he knows those guys, or guys like that, and some of them know him. He's Italian through and through, but he's a special kind of Italian-American hybrid. He's not old country Italian. There are no goombas in other countries, even Italy. There may be some kind of equivalent- some kind of tough guy from Iceland or Russia or somewhere - but the only true goomba is your Italian-American goomba. You know the stereotype. It's the fat guy sitting at the corner social club, drinking espresso and playing cards and eating a big plate of soggy macaroni. He's got his napkin tucked into his collar. He's wearing a pair of baggy black pants, a pair of patent leather shoes, and one of those guinea shirts, the sleeveless T-shirts that some guys use as underwear. He has nine gold chains hanging from his neck. He's got pinky rings on all three pinkies. The look on his face says "Moron." This guy doesn't have a job, or maybe he's a petty criminal of some kind, because that's the only work he's smart enough to do. He's almost mobbed up. The only exercise he ever gets is maybe lifting some weights and hoisting that fork full of macaroni. If he talks, he only says something like, "What are you looking at?" That's the cliché. And like every cliché, it's partly right. but I myself am a goomba - and I'm not any of that stuff. I'm a college graduate. I know how to read a book. I don't sit around all day playing cards and sucking garlic. I don't beat my wife. I've never been in jail. I don't play the ponies or the nubmers. I have never taken out a contract on anyone. But I'm a goomba, right to the heart, and I'm proud of it. Some Italians take offense if you call them a goomba. Especially if you say it the wrong way. It's kind of like how a black guy can use the "N" word to another black guy. Or how a black guy can call his friend "blood." Or how a certain kind of hillbilly can call someone a "redneck," or how a guy from the Midwest can call someone an "Okie." You say it with a smile, you might get a laugh. You say it any other way, or you say it and you're not an Okie or a redneck yourself. . . you're gonna get your clock cleaned. The word "goomba" itself is a little confusing. No one knows where it really comes from. Most people think it started off as the word "compadre," which is a term of respect. You can use it to refer to your godfather, your protector, your older cousin or older brother or uncle. From "compadre," it got shortened to "compa," which got twisted into "gomba," which got turned into "goomba." If this sounds a little far fetched, you should know right now that goombas do that with words. Everything gets chopped up, chopped down and turned into a slang version of the original word. No goomba says "pasta e fagioli" when he means a soup made of noodles and beans. He says, "pasta fazool." No goomba says "mozzarella." It's always, "mozza-rell." No one says "proscuitto." It's just, "pro-shoot." Even English words get the treatment. No one says "one hundred dollars," when they mean $100. They may say, a c-note or "a hundge." As in, "I gave the guy a c-note," or, "This guys into me for two hundge." Even the word "wop" is supposed to be a short version of the Italian word "guapo," which means "handome." It started as a compliment, but it got turned into an insult. Some people even said wop stands for without papers, a reference to their recent immigrant status. That has almost happened with the word "goomba." When used by non-goombas, it can be a derogatory word. Along with some of those other derogatory words that ignorant people sometimes use to describe the goomba. Goomba is not "wop." It's not "guinea." It's not "dago." These terms are always offensive to an Italian-American, whether he's a goomba or not. They are words used by non-Italians to insult Italians. It is not smart to do this. You shouldn't use these words around a goomba unless you are a masochist and have excellent health insurance. Somebody's gonna get hurt, and it ain't gonna be the goomba. Better stick to "goomba," and better use it the right way. Cut the hard ends of the tomatoes off and discard. Heat the olive oil in a wide, heavy pan. Saute the garlic until it is soft but don't brown or burn it! Add the tomatoes, then add the tomato paste, oregano, salt, and pepper. Simmer over medium heat for 30 minutes, stirring occasionally, until the tomatoes begin to break down and turn into paste. Adjust the seasoning to taste. Stir in vodka and immediately remove from heat. Heat 4 quarts of water in a big pot. When it's boiling, put in the rigatoni. Cook until the noodles are as soft or as firm as you like them. Drain completely in a colander. Portion out the noodles, and spoon out the sauce over them. You'll eat like it's your funeral." Excerpted from "A Goomba's Guide To Life" by Steven R. Schirripa and Charles Fleming. Copyright© 2002. All rights reserved. No part of this excerpt may be reproduced or reprinted without permission in writing from the publisher. His acting career developed backwards. He was never involved in acting in his school years. In his late teens, he moved to Las Vegas where he held many odd jobs (started off making sandwiches at a Jewish deli, then had several bouncer/security jobs). He was eventually promoted to maitre d' at a comedy club and later became entertainment director, booking stars like Ray Romano, Pauly Shore, and Paul Rodriguez. 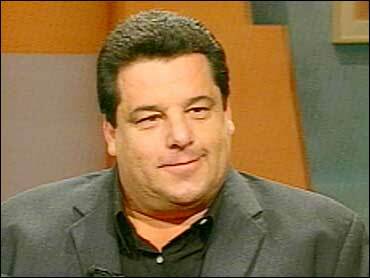 Schirripa then began to audition for several small parts in movies. He got goomba parts in "Fear and Loathing in Las Vegas" and "Play It to the Bone". He also had parts in "The Adventuress of Joe Dirt", "The Flinstones: Viva Rock Vegas", "Chicago Hope", and "The King of Queens". After several years of small parts, Schirripa decided to get an agent, started taking acting classes, and then began to figure out what he was doing with his career. He got the role of Bobby Bacala on "The Sopranos" by accident. He was in New York City for a friend's wedding and heard about the audition. He auditioned for the part of an FBI agent, but landed Bobby Bacala's part.